BALTIMORE (WJZ) — Families struggling to pay for their prescription medication will have a champion in the Maryland General Assembly this year. Suzanne Schlattman tells WJZ’s Pat Warren that she is joining the fight to make drug companies more accountable for their pricing after her experience with the rise in cost of the EpiPen. “Well my son was diagnosed when he was 4 months old with food allergies, and so he needs an EpiPen, and without an EpiPen he could have an emergency,” said Schlattman. 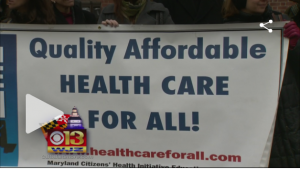 Maryland Health Care For All and their supporters are hoping to bombard lawmakers with callers urging them to pass prescription affordability bills. These bills require drug companies to explain their high prices, notify the public of substantial price hikes before they start charging them, and give the attorney general the power to sue if they don’t. You will recall the outrage this summer over the price hikes on cancer drugs and EpiPens, which dispense life-saving medicine to those with potentially fatal food allergies. So when the company constantly raised the price on the device to deliver the shot, it poked the bear. The Prescription Drug Affordability Initiative was launched Tuesday to help get prescription affordability bills passed. “I want to focus on the price-gouging legislation that we’re going to be filing,” said Maryland Attorney General Brian Frosh. AG Frosh filed a lawsuit last month, along with 19 other states, against six generic drug manufacturers who they claim conspired to fix prices. Some doctors are also witnessing the effects. “I have patients coming back to me week after week saying, “yeah it was very nice. I took your drug for a couple of days, but I couldn’t afford any more, so I stopped taking it’,” said MedChi President Dr. Stephen Rockower. The goal of the initiative is to make prescription drugs more affordable, but whether these bills can do that remains to be seen. The general assembly session opens Wednesday, January 10.